Note that the screw has two different size threaded ends and only one nut. The nut will fit perfectly onto the smaller screw, yet the performer does the impossible and threads it onto either end. Surely that is impossible?Precision made in brass. 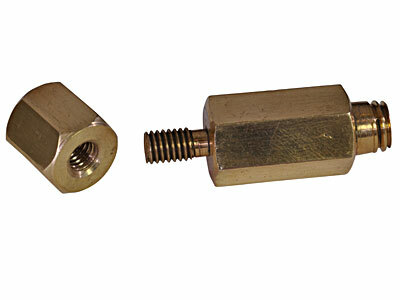 Complete with detailed instructions.No skill required, it can be repeated immediately.The item is made of brass, everything can be examined.When the nut is screwed on one of the two ends, the bolt is 4.5cm long and 1 cm in diameter. The Impossible Screw trick is very clever and well made, but the instructions don't describe how to perform the illusion well. It just explains how it works. I?? ?ll have to improvise (and watch the site video again).